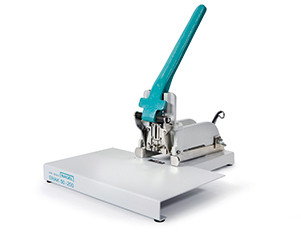 Robust manual stapler for pads of up to 17 mm thickness. The operator needs little force to handle the stapler, thanks to a favourable leverage. A non-distorting cast iron body with milled guides ensures reliable stapling and high durability. Infinitely variable back stop with large throat depth. Wear parts can be easily replaced.